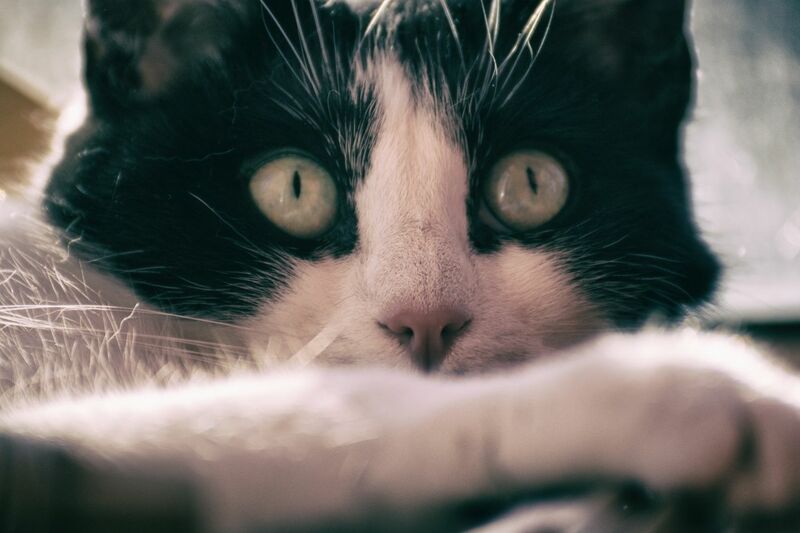 Today I shot a photo of my cat Shyna with my Tamron 70-300 lens. It’s usually the lens that I use when I try to take photos of birds outside, but I noticed several times that it also can be very well used to take portraits. My cat did sleep in her small basket and I thought it would make a great photo, but she noticed it and woke up, but I like the photo anyway. I applied one of the filters in Analog Efex Pro 2, you can get it bundled with other cool preset tools if you download the free Google Nik Collection that you should definitely try out. [ Smiles ] Shyna is an adorable cat! What do you think of the lens? They make one for my camera, too and I’ve been wondering I’m not thrilled with my long lens. Since I own the Nikon 50mm 1.8G, I definitely know that it can be sharper, but I think that is an unfair comparison because this would be basically a prime lens and a 50mm that is known to be very sharp if stopped down. I’d say I am very pleased with the Tamron lens when it’s summer and spring, because then I can use it at f/8 or at f/11 where it becomes sharper. In the dark Northern German autumns and winters, I need to compensate settings and have less freedom then. Many reviewers said you should think the Tamron 70-300mm is a 70-200mm lens. So, if I need 300mm reach and the weather is dark, it can get me into the less sharp territory if I am forced to f/5.6. But same applies for my 18-105mm Nikon lens, and with dark weather image quality suffers because of higher ISO anyway. About the Tamron, I’d agree with reviewers that it’s less sharp after 200mm, but I still think the reviewers are hunting for issues and compare it with their experiences of prime lenses. What they say might be concerning for people who want to print large pictures, but what do I do? I use the images in the web and resize them to 1200px or 1000px width anyway on my blog. Apart from that, I did even crop most of my 300mm photos, and they are still not super unsharp. I am in the market for another long lens, but then it would be the Sigma or Tamron 300-600mm lenses, or the Nikon 200-500mm… but only to get even more reach. I am not so interested to swap my 70-300mm lens. Because I am not sure what to expect from the other brands, or because I am not sure if I can get it any sharper, despite of what reviewers say… I think to get it really sharper, I’d need to purchase a 300mm prime lens. I think zoom lenses are just less sharp at the long end because they need to fit all needs.